Okay, so first a few things. One thing that I have to get off my chest straight away is that this is not Buffalo-Style Tofu...it doesn't exist. It seems anything that is fried and spicy these days is tagged as "Buffalo-Style." But I will say that these crispy little morsels are addictingly delicious. Also, as I've mentioned on many previous occasions, I am not a vegetarian but am always looking for non-meat options. Thus said, are these any more healthy than chicken wings? Maybe, but who knows. They are still fried (and before you comment or email to ask, yes these can be baked and would be equally flavorful just not as crispy). But it's okay to indulge now and again, right? And don't forget to serve them with blue cheese dressing and celery and carrot sticks (if you want to go all out "Buffalo-style"), or eat them over a salad with blue cheese dressing as I did today (yum!). 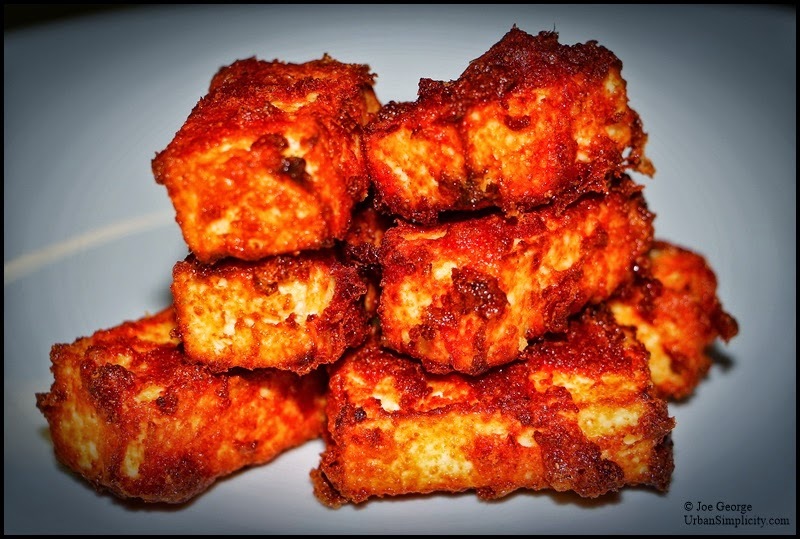 Anyhow, these are really easy to make--just a few ingredients--and so delicious even a tofu hater will like them. Drain the tofu and remove it from its package. Place the tofu between two plates and allow it to gently press out some of its moisture for about twenty minutes. Then dice the tofu and place it in a shallow pan. In a separate bowl, mix together the hot sauce, cornstarch, onion, and garlic, making sure that the cornstarch is fully dissolved. Pour this mixture over the tofu and gently lift and move it to insure that is fully coated. Allow it to marinate for about 20 minutes. Then remove the tofu from it's marinade to a clean plate. Heat about 1/2” vegetable oil in a large skillet over medium heat. And when the oil is hot carefully add the marinated tofu. Fry for about 5 minutes, turning as necessary, or until golden and crispy. Transfer the crispy tofu with a slotted spoon to absorbent paper.